This part-time summer program is available for teens who want to begin training to become outdoor professionals. Most participants of this program are past Wolf Camp participants who want to complete our Outdoor Teaching Apprenticeship over multiple summers until eligible for hire as instructors. CITs and instructors gather around a set of tracks during a night-tracking teaching scenario. 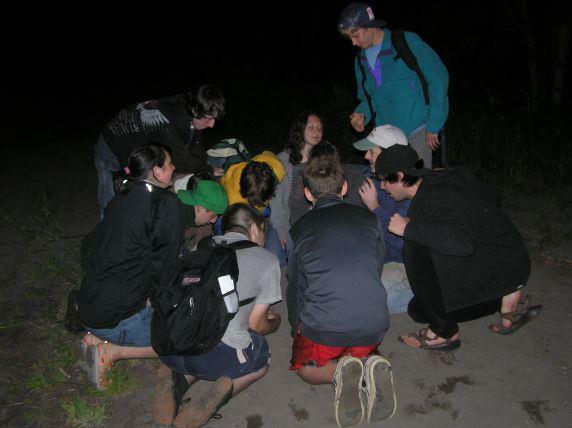 June 23-28, 2019 Option: Backcountry Leadership training course is only required to start the Youth Mentoring CIT course if you have never attended an overnight Wolf Camp week in the past. To graduate from the program in future summers, you will eventually need to take an equivalent backpacking / risk management / outdoor leadership course later. If you attend this week of the summer, cost for this course will be $775 plus optional weekend stayover at $100. 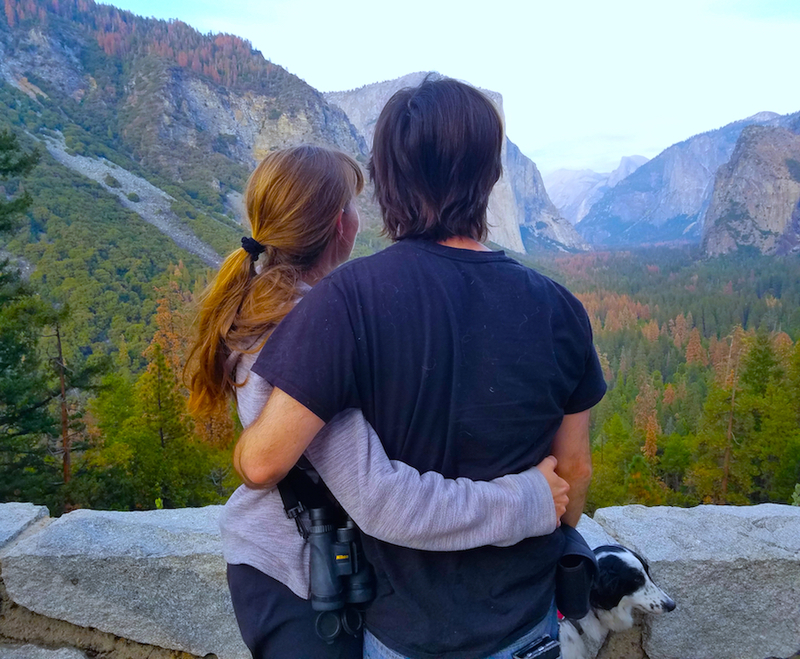 June 30 – July 5, 2019: Teaching Nature Professionally training course is required if you are accepted into the program, and cost for this course is $775, plus optional weekend stay over at $100. A) Attend an additional overnight camp week that you haven’t taken in the past in order to further your skills at $775/camp depending on when you apply, plus optional weekend stayovers at $100 each. B) Assist (as a CIT Mentor) during a minimum of one overnight camp that you have taken in the past at a price of $200 per camp. C) Assist at a minimum of one kids day camp during the summer which will cost you nothing if you stay at home each night, or $100 per week if you stay with us in the evenings and overnight. At minimum, your total cost per summer until you graduate into an instructor role will be $1,850 including one overnight training camp week, one new overnight camp week, one overnight mentoring week at a camp you’re repeating, and one day camp mentoring week including food/camping/facilities. There is no additional application fee. To speed up completion of the program to become a paid instructor sooner, you can also add more camp weeks not yet taken ($775/ea), additional weeks as mentor for camps already taken ($200/ea), assisting/mentoring at more day camps ($100/wk), and weekend stayovers ($100 each). eventual eligibility for employment at Wolf Camp and strong recommendations for employment elsewhere. 1) Over the course of multiple summers, attend and/or assist at least one week of Backcountry Leadership Training, Teaching Nature Professionally, Survival Side of the Mountain, Wildlife Tracking Safari, Wild Chefs & Herbal Medics, Archers-Artists-Artisans, Secrets of the Ancient Scout, plus at least one additional week such as the Epic Fishing Camp, Advanced Primal Bushcraft, or the Zombie Apocalypse Survival Challenge. 2) Return to mentor at least one of those overnight camp week, or complete academic year training using Wolf Journey or another curriculum, in order to gain expertise in at least one area of outdoor education. 3) Assist at a minimum of six day camp weeks. Must include at least one Wilderness Skills Sampler, one Wilderness Survival Craft, one Wildlife Search & Rescue, one Wild Cooking & Herbology theme, and two advanced day camps or farm/pioneer camp themes. 4) Receive evaluation from the Conservation College adult program director signifying ability to lead at least one age range of the aforementioned day camp themes, or pass with at least 90% score on of the certification evaluations: Ethnoecology; Ethnobotany; Herbalism; CyberTracker Trailing; Track & Sign. Wolf Camp started in 1996 by offering adult workshops and after-school youth classes, and then officially launched summer youth camps in 1997. By 2002, we had our first returning camper (Griz Chambers) ready to train as an instructor. Griz piloted the CIT Mentoring Program by participating in a modified version of the apprenticeship program which had started the year prior. We called his role Youth Mentor. The next year, we had our first Youth Mentor CIT group participate in our training week, and during the second official Youth Mentoring training week, a group of five talented young people (many of whom are now on staff) developed a “medicine wheel” of ethics and responsibilities associated with being a good mentor or role model when helping to guide others into the field. What we did was to chart those ethics and responsibilities on a wheel. We began posting the ethics and responsibilities in the upper-right area of the wheel and called it the “northeast” because the sun was rising in that direction (it was just after the summer solstice). We decided to place the concepts of humility and respect there, or “humble respect” in the northeast. Without this ethic of humility and/or respect, we can never be open to new possibilities, nor take direction from our elders or listen to our children. In fact, this is the direction in which many people believe our ancestors and “future generations” dwell, the very entities from whom, and for whom, we bother going around this wheel. Then we agreed to place “appreciation” in the east, initially because we had heard that some members of the Iroquois confederacy talk about “words before all else,” meaning that it is critical to start with an attitude of appreciation, and to speak those sentiments before beginning any journey, meeting, celebration or other endeavor. Appreciation, we also decided, included open-mindedness and acceptance in its definition. Turning to the “southeast,” we must remember to use our intelligence, which is a combination of our common sense and creativity. As one of the youth mentors pointed out when thinking about assessing a new relationship, we may be initially attracted to people in the east, but it is smart not to spend time alone with them until we thinks critically about whether they will treat us well. In other words, we must choose to think critically after our heart is into something before choosing to proceed. In the “south,” we placed honesty, but we also liked the concept of sensitivity in that location, so although we decided that it was important to be honest, it was also important to speak the truth with sensitivity toward how our words and work would be received by others. We also thought that it was important to flush out the truth before really getting too far into a project or relationship, thereby helping make it flow as smoothly and efficiently as possible. When considering the southwest, we realized that we really needed to work hard to accomplish anything, or to work through the difficulties of a project or relationship. We decided that the act of willpower in the “southwest” was an ethic that needed to be developed more in order for us to not succumb to forces that draw us away from our highest good. We can pray and hope that our higher power will keep us from engaging in our vices, but in the end we must try to have the strength to choose the high road ourselves. The more we can develop our will forces, the better we can serve a project or relationship. The Iroquois again teach us the second of their three “principles of peace,” which is the concept of unity which we placed in the “west.” Since we are dealing with the field of outdoor education, we need to remember to balance our egos and stay united not only with our personal tribe, but also as a confederated set of outdoor educational institutions. 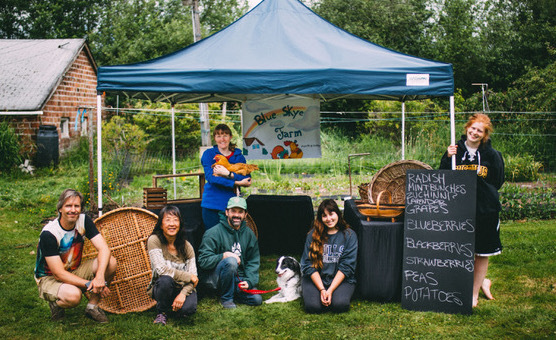 Turning to the northwest, we wanted to remember that it is important to enjoy what we do in the “northwest”, and endeavor to maintain interest in the skills even though we have been working with them for quite some time. In addition, before we can truly love (the ethic we placed in the north), it is critical that we choose to have interest in others In the end, love is a choice and no longer a feeling of infatuation. I have found that choosing to have interest in someone or something is one of the critical aspects in order to achieve true love. So, in the “north” rests the ultimate achievement: peace and love. Again, we find the Iroquois principles of peace as our standard, that we must hold an uplifted mind of peace. In order to sustain it, as the fallible humans that we are, we must continually do all the other work around the rest of the wheel. 1) Ethic of appreciation in the east: write thank you notes to students who attended courses which we mentored. 2) Ethic of unity: pass around a contact list for students in a group to write their contact information if they wish. Forward the list to each participant who wrote down their information. 3) Southeast, ethic of intelligence: to mentor courses in the following busy season, maintain a 2.5 grade point average (80% or B-/C+) overall, and have no failing grades. 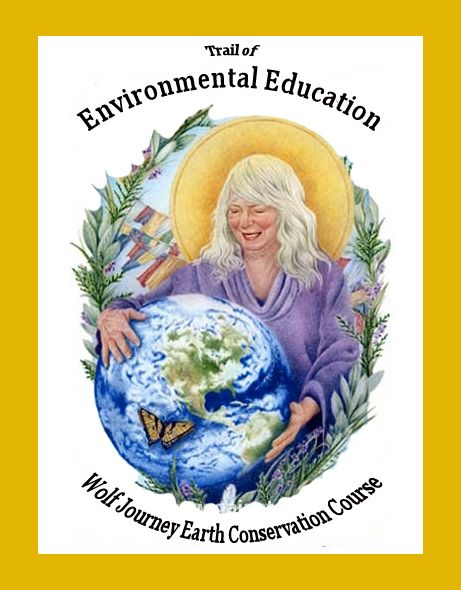 Enroll in at least one week of new earth skills training each year, and journal at least 1 chapter of field exercises in Wolf Journey or an equivalent curriculum. 4) South, ethic of sensitive honesty: cannot mentor a program for one year if any significant law is broken except for purposeful civil disobedience. 5) North, ethic of love and peace: in the offseason, be a mentor to someone who looks up to you or form a better relationship with someone you dislike. 6) Southwest, the will to serve: do an earth skills related service project. We could teach a new group of students some skill back home, or do something like a restoration project. 7) Ethic of humble respect: do some service for an elder in our lives, such as a parent, teacher, or other mentor. TRUTH: This value was symbolized, or embodied by, the Turtle in the museum’s display. It was explained that the Creator is Truth, like the Sun is always true, as no one can change it. Truth represents that which never changes. HONESTY: This value is embodied by the Sasquatch, also known as the Wilderness Man. In the display, honesty was described as having to do with how we see ourselves, that we need to see ourselves accurately in order to achieve health, happiness, and harmony in life. Wilderness Man was described as looking after human life. His honesty encourages ours, and is reflective of how we treat his home: the natural world. HUMILITY: This value was embodied by Wolf, who teaches us our place, as we put ourselves where we belong in the universe. COURAGE: Bear represents moral courage, the strength to follow the Way. In other words, it gives us the courage to embody all 7 of the teachings, to responsibly care for our families and each other. LOVE: Through its love for people, Eagle says that to love someone, you have to love yourself first. 1) Write clear, concise goals as a Youth Mentor, including your intention to complete what you begin. 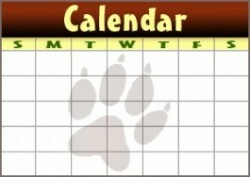 2) List your planned schedule, including time at Wolf Camp and time elsewhere this summer, starting with the day school ends and when it starts again in the fall. Use the Schedule Options section above as a guideline. 3) Expand on the definition of Humble Respect when it comes to treating your peers, elders, and younger children, as described in the “northeast” in the Background section above. 4) What does it mean to really Appreciate your peers, elders, and younger children, expanding on the description of “east” in the Background section above? 5) What are the limitations of Intelligence, Common Sense, and Creativity, if any, when dealing with peers, elders, and younger children, according to the description of “southeast” above? 6) Where do you draw the line between Honesty and Sensitivity when interacting with peers, elders, and younger children? Use the description of “south” above as a guide. 7) In what ways do you react unconsciously in situations, where you need to increase your Will forces when dealing with peers, elders, and younger children? Use the description of “southwest” above as a guide. 8) Where do you draw the line between Unity and personal freedom in relation to peers, elders, and younger children? Use the description of “west” above as a guide. 9) Can you be genuinely interested in peers, elders, and younger children even when you don’t feel like it? If so, give an example, and use the description of “northwest” above as a guide. 10) Give your definition of Love, using the description of “north” above as a guide. 11) What has been your past experience with teaching, organizing or guiding peers, elders, and/or younger children, if any? 12) List all previous outdoor educational training you have received, both personally and institutionally. 15) Include a letter of recommendation from a recent employer, or if you have none, then someone you have done personal work for. 16) Include a letter of recommendation from a recent teacher. 17) Copies of any certifications, degrees, licenses and background checks should also be provided if 18 or older. 18) Read the Expectations & Agreements section above, and write any questions or concerns you have with them. Otherwise, acknowledge that you understand your expectations and agree to abide by Wolf Camp guidelines. 19) Sign and date your application, and note any improvements we should make to this page, the website, or camp in general. Thanks! e) $100 payment per weekend stayover, if any. Refund Policy: Standard deposits ($75 for day programs, $175 for overnight programs) are not refundable unless we don’t accept your application. If you cancel for any reason, you may receive a full credit good through the following calendar year on appropriate and available programs listed on our schedule, although an additional deposit may be required to secure your spot in the future program. If a program you sign up for is canceled and not rescheduled at a time you can attend, you may receive a full refund except in case of natural (weather, geologic, etc) disasters, government shutdowns, conflicts or curfews, or other unforeseen emergencies making it impossible for staff and/or attendees to reach or use program locations, in which case all payments made will be held by us without expiration date for your future use in appropriate/available programs of your choice. No refund, nor credit, is given if a participant is asked to leave a program for inappropriateness as determined by our kids, youth and adult agreements for participation and homesickness protocol.